Every day in our Toronto clinic, we see arthritis pain in hands and fingers, arthritis pain in the back, and arthritis pain in knees. Often, arthritis makes it hard for these people to just get through the day. And that’s before it develops into more severe weakness, muscle wasting or chronic restricted movements. Contrary to popular belief, it’s not just older adults who experience arthritis pain – younger adults and even children suffer from it, too. Here in our clinic, we use naturopathic remedies for people seeking arthritis pain relief. Combatting inflammation. Naturopathic medicine provides various anti-inflammatory supplements depending on the type of arthritis you’re suffering from. An anti-inflammatory diet along with acupuncture can also have a big impact on your arthritis. Exercise. Physical activities that take the weight off the joints such as swimming, water walking and water aerobics can help relieve arthritis. Natural remedies for arthritis pain. Some of the things you can do by yourself to treat arthritis are to exercise regularly and adopt a healthy diet with fewer processed foods. And although it’s not the first thing most people think of, meditation can go a long way to help you deal with the pain. Acupuncture for arthritis pain management. Acupuncture brings effective arthritis pain relief both in the short and long term. Exercise. Engaging in physical activity – especially strength-training exercise appropriate for your body – can really help reduce arthritis pain. Nutrition. Supplements such as pycnogenol and curcumin are very helpful, and egg shell membrane is another one that we’ll often implement. And that just helps to minimize the pain at the joint itself while we work on some bio-mechanical approaches to help reduce the stress and wear and tear on those joints. Acupuncture. Is incredibly effective for arthritis, especially when done with an electrical stimulation machine, which sounds a bit scary to some, but really feels like nothing. Arthritis pain. Most arthritis pain is suffered in the knee, hip, back and spine. Various remedies. Swelling of the joints can be relieved by elevating the area and using either ice or a hot compress. 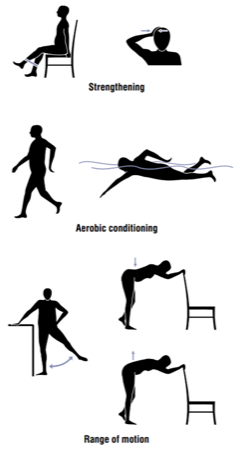 Low-impact exercises such as walking or swimming can ease the stress. Anti-inflammatory creams are likewise beneficial. Finally, supplements can really help correct nutritional imbalances. Conventional and naturopathic together. I’m not one of these naturopaths that’s completely opposed to anything pharmaceutical. I’ll try an arthritis pain medication like Voltaren – a topical anti-inflammatory – but I’ll usually half the dose and then split it with doing something like a Traumeel gel – a homeopathic remedy. Acupuncture. This helps a lot in treating arthritis pain. You need to commit to a number of treatments, but positive results are very often experienced within ten sessions. If you’re looking for relief from your arthritis pain, contact our receptionist at 416-792-4400 or by using the form below and she will book you for a FREE 15-minute phone or in-person consultation with one of our practitioners.